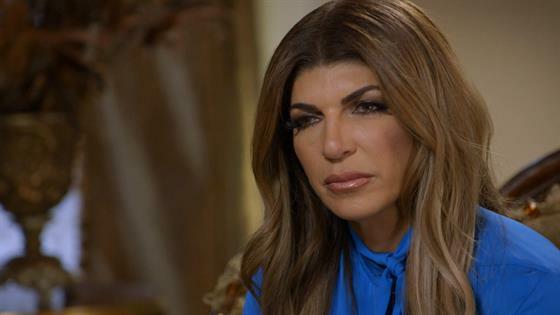 The Real Housewives of New Jersey star Teresa Guidice is getting a much-needed message from her late mother, whose tragic death was chronicled on the Bravo reality show. In this clip from Wednesday's season finale of Hollywood Medium With Tyler Henry, the medium begins to channel Teresa's father who never had the chance to say goodbye to his late wife. "The way this comes in, she's putting a lot of emphasis on the release of guilt around your father, like really heavily, like, 'Let go of guilt, let go of guilt, let go of guilt,'" Tyler Henry says. Teresa confirms that her father did feel guilt-ridden after his late wife's passing. "There's something that's sad about how she passed. He does feel guilt because he never got to say goodbye to her. He was sick, he got pneumonia. And he went to the hospital and then she got pneumonia the next day. So then they brought her to a different hospital, so they never got to see each other," Teresa reveals. Teresa goes on to detail that difficult day and what led up to her mother's death. "I didn't want him to know she was in the hospital because I didn't want him to get upset. I figured when they got better, they were gonna see each other. So my dad never got to say goodbye to her and then I had to tell my father. It was so hard," Teresa says, holding back tears. "When my father saw me and my brother walk into his hospital room together, he knew right away. Me and my brother were a mess." "That's not a place you should ever have to be in. The way this comes in, she wants dad to let go of any guilt and that's one of the biggest messages in the way this comes in. She wants him to let go of guilt. So I hope that he is able to let that go," a sympathetic Tyler adds. See Teresa open up about her mother's death in the clip above. Catch brand new episodes of Hollywood Medium with Tyler Henry, Wednesdays 7.30pm AEDT on E!